The Resuscitation Sciences Training Center (RSTC) is an authorized American Heart Association (AHA) Training Center providing AHA courses including Basic Life Support, Advanced Cardiovascular Life Support, and Pediatric Advanced Life Support. The RSTC also supports other courses including the Neonatal Resuscitation Program. These courses are open to Penn State Hershey Medical Center and Penn State College of Medicine providers as well as to individuals from outside our organization. 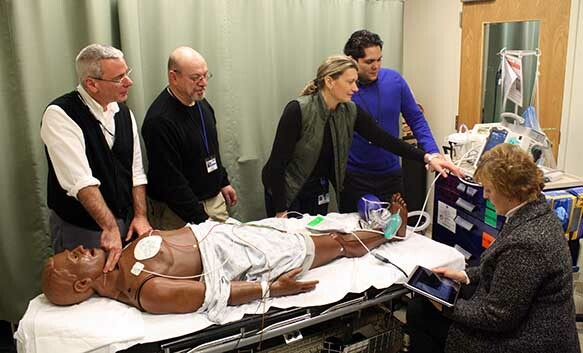 RSTC instructors Phil Stark RRT, Lee Groff EMT-P, Holly Ray RN, Angel Diaz Sanchez MD and Esther Zechman BSN, RN work with one of the high technology simulators used in ACLS.